A Special Court in Pakistan, on Monday, indicted former military ruler General (retd), Pervez Musharraf on the charge of high treason, a crime which could lead to a death penalty or life imprisonment. Musharraf who led Pakistan from 1999 until he was forced to resign in 2008 faced five charges during the hearing on Monday, including three counts of subverting, suspending and changing the country’s constitution in 2007, when he imposed emergency rule and fired top members of the judiciary. He pleaded “not guilty” in each of the charges. He was an important ally of the United States in its efforts against Islamic extremism and militancy. While in power, he survived several assassination attempts allegedly orchestrated by Al Qaeda and Taliban militants. 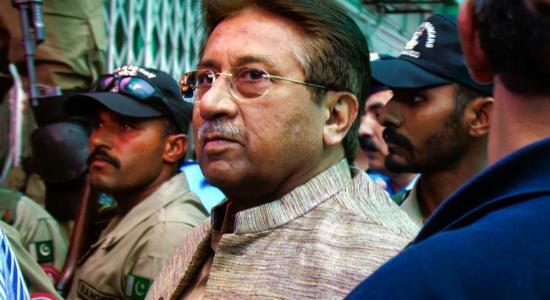 Musharraf, who has been at a military hospital in Rawalpindi since January, had repeatedly avoided appearing before the special court, citing medical and security concerns because the indictment that were to take place in last December got delayed. He appeared before the three member judge panel only on February 18. Musharraf said he was not a traitor and claimed that the country prospered under his rule. Pakistan media reports say that the former military general has asked permission to visit his ailing mother who is in a hospital in the UAE. Monday’s hearing took place amid tight security, with thousands of police and security forces lining the route to the court. Musharraf was represented by a new lawyer, with no reason given for the change. Other cases against him include his alleged role in the murder of former Pakistani Prime Minister Benazir Bhutto, the death of a Baluch separatist leader killed by the army and the killing of a radical cleric.